The campaign was characterised mostly by public rallies by the prominent national and state leaders while the candidates concentrated mainly on roadside meetings and door to door campaigning. High decibel campaigning for five Parliamentary constituencies in Assam going to polls in the first phase on April 11 ended on Tuesday. Campaigning for Tezpur, Kaliabor, Jorhat, Dibrugarh and Lakhimpur constituencies ended at 4 pm and polling will be held on Thursday to decide the fate of 41 candidates, including two women, in the fray. Prime Minister Narendra Modi, Congress president Rahul Gandhi, BJP chief Amit Shah, West Bengal Chief Minister Mamata Banerjee and her Uttar Pradesh counterpart Yogi Adityanath along with Assam Chief Minister Sarbananda Sonowal, former Chief Minister Tarun Gogoi were some of the prominent leaders who campaigned in the state. 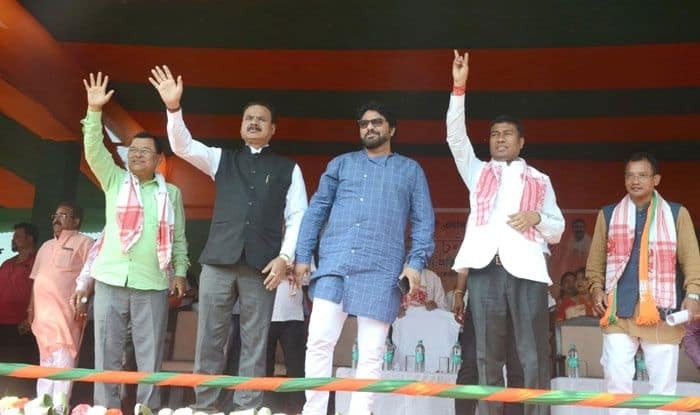 Singer and BJP MP Babul Supriyo campaigned for his party candidates while actress and Congress member Naghma campaigned for party’s Kaliabor candidate and sitting MP Gaurav Gogoi by participating in a roadshow. The ruling BJP concentrated on the initiatives taken by Prime Minister Narendra Modi to develop Assam and the North East, including the inauguration of three bridges in the state while the opposition Congress and other parties highlighted the BJP’s attempt to bring in the Citizenship Amendment Bill and the alleged failure of the Modi government to fulfil the promises made before the 2014 Lok Sabha polls. There are three sitting MPs -two of the BJP and one of the Congress while two state ministers are also pitted against their Congress rivals. Lakhimpur has the highest number of 11 candidates in the fray but the main the contest is between sitting BJP MP Pradhan Barua and Congress candidate Anil Borgohain, who has been given the ticket for the first time. In the neighbouring Jorhat constituency also eight candidates are in fray and the contest is between state Power Minister Tapon Gogoi of the BJP and former Congress MLA Sushanta Borgohain. In Kaliabor, sitting Congress MP Gaurav Gogoi is pitted against AGP’s Moni Madhab Mahanta while in the Tezpur constituency state Power Minister Pallab Lochan Das of the AGP is fighting it out against retired bureaucrat MGVK Bhanu of the Congress. There are two women candidates-Ribulya Gogoi of the Trinamool Congress and independent Nandita Gogoi, both contesting from Jorhat and 12 independents in the fray for the first phase. A total electorate of 76,03,458, including 38,65,334 male, 37,37,970 female and 154 of the third gender will exercise their franchise in 9,574 polling stations in the five constituencies.